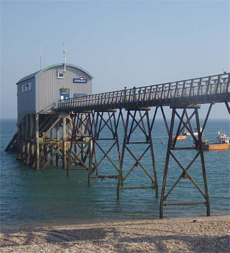 If you London Divers have not already been diving down around Selsey, West Sussex, then I recommend that you head down there, as this is a great place for some really enjoyable UK diving and it's so close to our smoggy city. Some of the top dives here are: the shore dives of The Lifeboat Station or East Beach Ramp or further out to sea is The Far Mulberry or Mixon Hole. The water is brimming with life and best of all in spring, you have a good chance to see that fine old ugly fish – the lumpucker. Not a bad choice of places to eat here in Selsey. I thoroughly recommend grabbing some classic British fish and chips for lunch. Nice Plaice Fish & Chips (located on East Beach Parade) cook everything fresh to order and often with locally caught fish available – truly wonderful and will certainly keep away those diving hungry grumps. There are also a couple of pubs that serve up some good food. Both The Seal and The Lifeboat have reasonably priced menus. The Lifeboat has a restaurant menu in addition to the bar menu. However, book in advance as the restaurant does get pretty hectic. The High Street also offers a choice of Indian, Chinese and a variety of take aways. The top Indian seems to be the New Magna Tandoori Restaurant. The Seal and The Lifeboat are perfect for a couple of pints at the end of a day's diving, but there are a number of other pubs to try out too and the atmosphere in Selsey is really friendly. But if there's a big group of you and you want to shake those booties then I'm afraid you'll have to head in to Chichester. A couple of local cab firms will offer good prices so no one need drive – ask to be taken to Thursdays Night Club. Next article » Can I Dive With - An Outer Ear Infection?